GRIEVING relatives visiting the graves of loved ones at a Birstall church say they are tired of regularly having to step around dog mess. One man said he sometimes wished his son had never been laid to rest there because of the stress and anger that comes with visiting his grave. He and another couple got in touch with The Press because they felt more needed to be done to keep dogs under control at the St Peter’s Church graveyard on Kirkgate. They visit the graveyard every day and are met with piles of dog muck left behind by owners – sometimes even on the graves. They say the animals are often let off their lead by owners who don’t stop them disrupting adornments and memorials. The couple say signs requesting owners to control their dogs and clean up after them are being ignored – and they have even been verbally abused by owners when challenging them for letting their dogs loose. One graveyard visitor asked for clearer notices telling owners to keep their dogs on leads at all times. The graveyard is managed by the church, not Kirklees Council – which means dog owners are not fined if their animal fouls in the grounds. Vicar Paul Knight said: “I am concerned and fully agree with those who have raised the issue, that the behaviour of some dog owners is unacceptable and especially within the graveyard, where unseemly dog behaviour and fouling is both disgraceful and disrespectful. I am a dog owner and know that the irresponsible behaviour of some owners reflects unjustly on all. The matter was put before the Parochial Church Council at a meeting on January 14 when the council took note of all concerns, whilst recognising that they were not in a position to ‘police’ the graveyard. “They did agree, however, that notices requesting dog owners to control their dogs and to clear up after their pets, should be placed in the graveyard. Another meeting between relatives, Rev Knight, Batley & Spen MP Tracy Brabin and Kirklees Council has been organised for Friday, February 15, at the graveyard, from 10am. Ms Brabin said: “This is, of course, a deeply upsetting issue for those who are visiting loved ones in the churchyard. “As a dog owner, I understand the responsibility that comes with that wonderful relationship – we must ensure we control and clean up after our pets in public places. 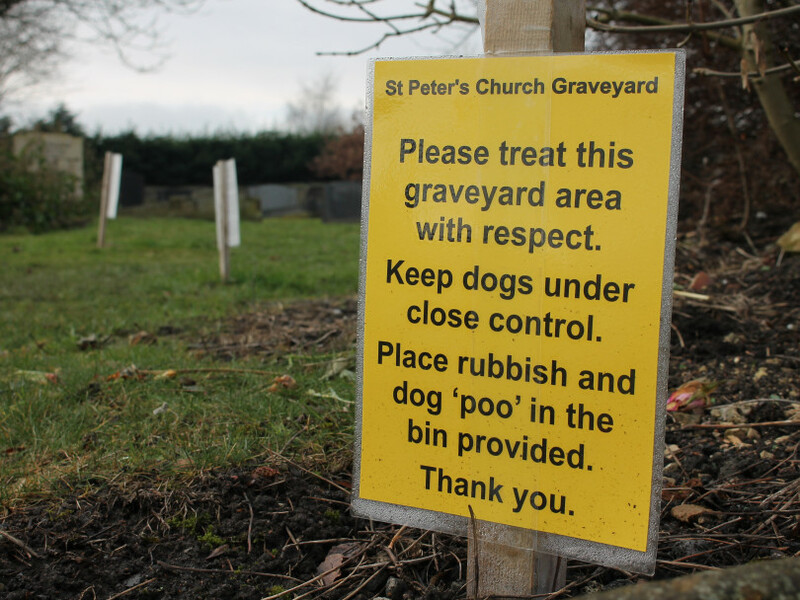 Some council-run cemeteries hand out on-the-spot fines to owners who don’t pick up their dog’s litter, which could be a potential solution to stop this from happening at St Peter’s. Families with loved ones buried at the graveyard are urged to attend next Friday’s meeting.